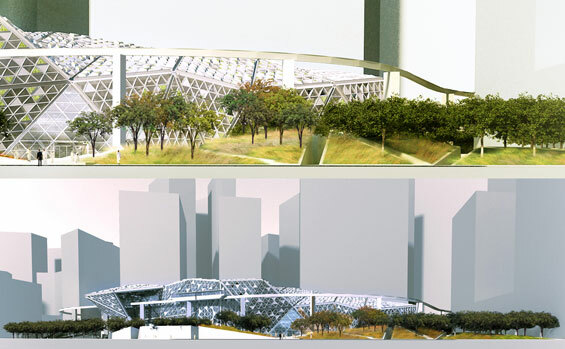 One of the five programmed “Attractor Parcels” of Henning Larsen Architect’s urban master plan, the KAFD Conference Center emerges as an iconic structure within the District’s southern terminus to its central public “Wadi” landscape. In collaboration with the Center’s architect – SOM, HM White has led its scientific team to design and implement this fusion of landscape and structure. 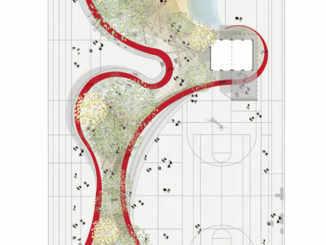 The landscape design re-introduces native arid grasses and flora into a large scale public space setting. 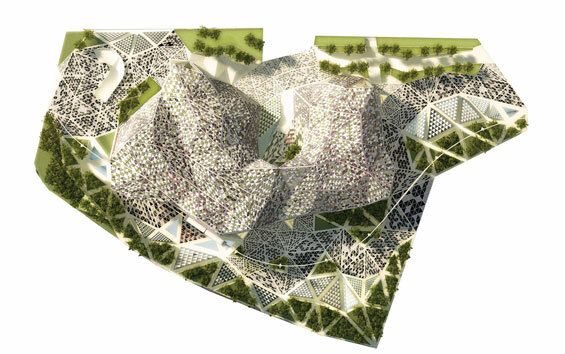 These indigenous plant communities spatially organize and blur the boundaries between the building’s undulating “exoskeleton” skin and its surrounding structural desert landscape. Arabian Peninsula meadow desert grasses and trees emerge as the connective tissue and establish an appropriately scaled expansive campus landscape. The planting palette is influenced by the plant communities that inhabit regional rock faces – specifically limestone cliffs. A custom formulated and tested hypertufa growing medium was developed to emulate the limestone cliff growing conditions. Flexibility to deploy cliff dwelling plants in a modular form across the conference center’s varied planes and surfaces enables both the vegetation and the hypertufa to mimic an endemic desert landscape. 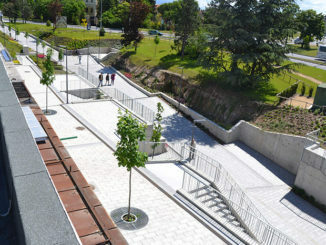 The design is as much about the ground and building surface as it is about the vegetation that emerges from it. 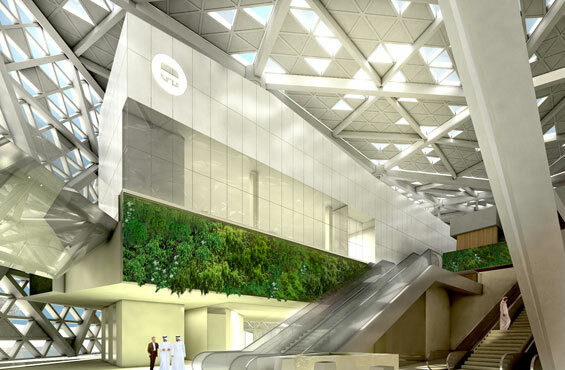 The exterior strategy seamlessly flows into the climate controlled public spaces of the building, where the vegetation becomes denser and creates a cooler, lush ambiance; thereby improving interior air quality. 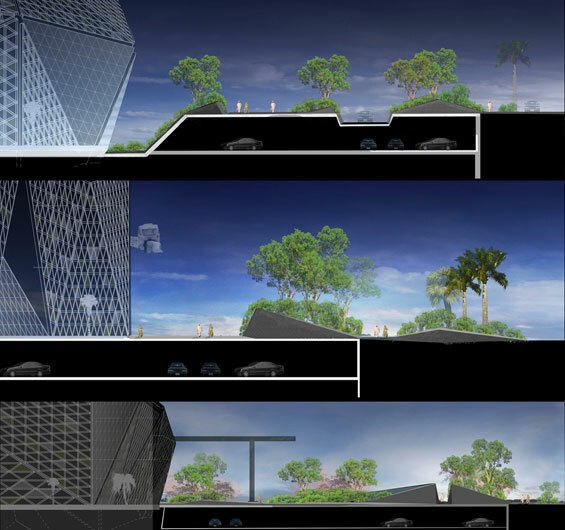 Interior living walls weave in overlapping planted planes. Consisting of wild Agaves, Bromeliads, xeric ferns and perennials, the interior typology is intended to emulate a grotto oasis. Groves of palm trees/shrubs and Cycads accent surface plantings in the highest sunlight levels areas. 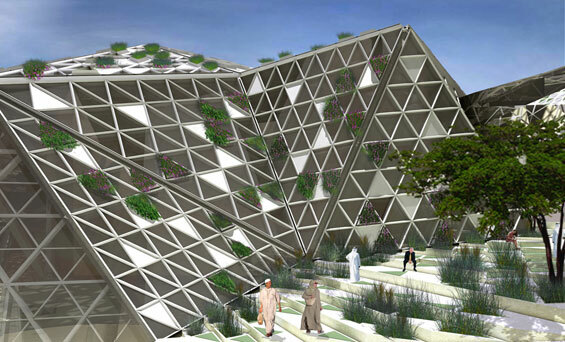 The future of Saudi Arabia’s public landscape will indefinitely be influenced by this project’s sustainable demonstration of viable “green” design strategies within a public domain and its renewed reconnection with the country’s ecological heritage. With an anticipated spring 2013 opening, the Conference Center’s statuesque presence and iconic design has led to the decision to use it as the location for King Abdullah’s KAFD development dedication speech. Project Management | Hill International (Middle East) Ltd.